In this verse of the Holy Quran, Allah has drawn attention towards such a topic that can brighten up our worldly as well as hereafter life. The importance of fasting is not because it was also the component of previous religions but because the followers can attain ‘Taqwa’ that is God fearing piety and righteousness through it. If someone does not fast with this essence of ‘Fasting’ that I will undertake and spend these days keeping in mind Allah’s desire and wish and refrain myself from everything that is not permitted and undertake every action that has been commanded and instructed by Allah, then the action of fasting is useless. One month of discipline/educating/mending ourselves has been provided to us. Thus one should try to improve in piety during this time. ‘Taqwa’ will improve the standards of your good deeds, it will lead to sustained pious actions, help you attain the proximity of Allah and one will be forgiven for the sins committed in past. Thus when all the previous sins have been forgiven and one persistently follows the path of taqwa, it is a witness to the fact that the person has successfully achieved the purpose of fasting and the cause of his/her life. Thus who is the one who doesn’t want to achieve success? The worldly achievements shall be left behind in this world. The real achievement for the person is the success in this world and in the hereafter. And that Allah explains that if you have wisdom so understand that the real triumph is achieved by following the path of Taqwa (God fearing piety). 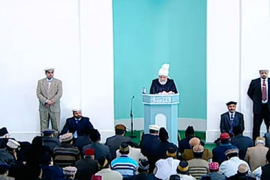 In Today’s world when the so called religious leaders are compelling Muslims to perform deeds that are truly against the teachings of Islam, the followers of Islam Ahmadiyyat are blessed that they had the opportunity to accept the Messiah of time who had true love of Islam and the Holy Prophet (peace be upon him). We, Ahmadis are lucky because the Promised Messiah (peace be on him) made us understand even the minutest detail of the teachings of Islam. Huzoor said that he has taken references from Promised Messiahs (on whom be peace) life and teachings in order to explain for our understand the meaning of Taqwa, of how can we achieve it and what is expected of the Jama’at members regarding this topic. These teachings from the Promised Messiah (on whom be peace) will help us improve our beliefs, continue on the path of righteousness and provide us code of actions for this month of our self-improvement. Meaning that the powers or thoughts that compel an individual towards sin and refrains from doing good deeds are a satan in one’s own self. Knowledge and wisdom are no doubt very noble traits. But if an individual is proud of his/her these respective traits and use them for doing immoral and bad deeds and/or bring them on competition with the good deeds, these traits eventually evolve into satan and evil doings. Who is righteous and what is his/her job? It is that the knowledge, wisdom and other power/qualities given to an individual by Allah Almighty be used for the right purpose. Because it is these virtues that can be very harmful and can divert away from Allah Almighty if they are not used at the right time and purpose. The narrative of righteousness is exquisite. To attain it inculcate the greatness of Allah in your hearts. Allah rejects practices which have even a little hypocrisy. It is difficult to be righteous. For example if someone accuses you of stealing a pen, why do you get angry? Your temperance is merely for the sake of God. Any anger felt in such an instance would be because the heart was devoid of God’s presence. Man does not become righteous unless he has gone through many stages of death-like state. Miracles and revelations are derivatives of righteousness but the principal aspect is righteousness. Therefore do not be too concerned with revelations and visions, rather pursue attainment of righteousness. Only the righteous have veracious revelations and any revelations received without righteousness are not dependable. They could have a measure of satanic influence. Do not appreciate anyone’s righteousness by virtue of them receiving revelations, rather, analyse his revelations based on the state of his righteousness. Close your eyes to everything else and first negotiate the stages of righteousness. Uphold the models of all the Prophets of God. All of them came for the purpose of teaching the ways of righteousness. ‘…Its true guardians are only those who are righteous…’(8:35). The Holy Qur’an teaches the fine ways of righteousness. Excellences of a Prophet require his people to also possess excellences. Since the Holy Prophet was the Seal of all Prophets (peace and blessings of Allah be upon him) he was the epitome of the excellences of prophethood. His Seal of prophethood was borne of this epitomising of excellences of prophethood. Those who wish to please God Almighty and experience miracles in an extraordinary way should make their lives extraordinary. The root to every virtue is righteousness so try achieving it. The meaning of taqwa( righteousness) is to refrain from even the slightest and smallest sin. Righteousness is abstaining from even those actions that you are suspicious of that they will lead to a sin. Heart is a metaphorical example of canal that has several other tributaries. Thus the tributaries coming out from heart are for example tongue, hands etc and if these performs ill actions so it is reflective to the fact that the main canal (that is heart in this case) also has bad intentions. And if you perceive that an individual’s tongue/hands etc are performing virtuous deeds then believe that his/her heart is empty of righteousness. ‘All the faculties granted by Allah the Exalted are not to be wasted, they are developed through right and proper use…It is stated: ‘Surely, success does come to the believers.’ (23:2) And after illustrating the life of the righteous it is stated in conclusion: ‘…And it is they who shall prosper.’ (3:105) That is, those who practice righteousness, believe in the unseen. They lose concentration in Salat, but then they recover and they spend out of which God has bestowed them. In spite of possible personal hazards they impulsively believe in the past and current Books of God and ultimately they reach the stage of certain belief. These are the people who are on the way of guidance. They on a road which stretches right ahead and which takes man to the station ofفلاح success/prosperity. These are the successful people who will reach their destination and they have been delivered from the perils of the journey. This is why Allah the Exalted gave us the teaching of righteousness at the outset and granted us a Book which carries commandments regarding righteousness. Holy Prophet (peace be upon him) or Hazrat Ibrahim (peace be on him) did not gain honor or reputation through heritage. Thus it is our belief that Holy Prophet’s father ‘Abdullah’ was not a polytheist. It is merely the blessings of Allah in return of their pious nature. It was the exalted piety and righteousness of Hazrat Ibrahim (peace be on him) that he did not over think before sacrificing his son. Holy Prophet (peace be upon him) did not care of the hardships that came along while fighting the bad practices prevailing at that time through sincerity and truthfulness that resulted in bountiful blessings of the Almighty Allah. Thus it is this good example that we all must follow. The true vision and wisdom cannot be acquired without predisposition towards Allah and until righteousness is achieved in its true essence. If a person wants to be successful then it is a must that one should meditate for it is essential to develop spirituality. One must read the Holy Quran and try to derive and understand the wisdom hidden in it. Quran reveals that using the thinking and wisdom to the best of its ability leads to understanding of the existence of Allah. In today’s world, people claim that God does not exist. This is because of the absence of wisdom and limited usage of their knowledge towards worldly means. Such people’s negligence from religion has resulted because their religions have been out dated. They have been deprived of Allah’s guidance. For us, the Holy Quran is the complete book for guidance and knowledge that provides us with a code of life. Intensive study and understanding of the Holy Quran eventually leads to righteousness. In short righteousness leads to affirm belief in the existence of Allah and ensures Allah’s presence in the heights of mountains, the depths of oceans and in the galaxy. A true believer develops a relationship with Allah and acts according to His guidance. Thus, during this month of Ramadan we should not only abstain from food but also seek for Allah’s true guidance as reflected in the Holy Quran. Promised Messiah (on whom be peace) said that we should purify our souls and abilities during this month of blessing so that we can make the most out of them. It is this righteousness and piety that Allah Almighty expects from us. If one has entered Jama’at and wants to serve Islam then it is a condition that one must purify oneself from all the bad habits and gain piety. We cannot serve Islam through mere conversations therefore must acquire purity and righteousness to undertake this service. As it is crucial to deploy horsemen/army at the borders in a war against enemies, likewise you should also be well equipped if you want to protect your religion from the hurtful doings of foes of Islam. If you want to truly present yourself for the service of Islam then you must first attain highest levels of purity and righteousness. This will help you achieve Allah’s love and blessing which is an essential pre requisite for this service. The Muslims have lost their superfluous power and other nations display disrespect and hatred towards them. If you also lose your internal powers then it will lead to your spiritual death. Do not possess morals and actions that present a bad reflection of your religion Islam. In today’s world, the few groups of Muslims that are undertaking violent actions are also projecting the wrong image of Islam. It is not the individuals who are being blamed for their wrong doings but their religion is portrayed to be bad. Therefore, adopt and practice a way of life that does not allow others to associate anything bad to your religion. Refraining from arrogance, egotism, self-projection, bad conduct and earning wealth through forbidden means is also righteousness and piety. A person who presents good conduct eventually compels his/her foes to be friends. It is preached by Allah Almighty that do not respond if any one abuses you but instead be patient. This will force the abuser to think over the ill act and be guilty over it. This punishment will be far more hurting than the revenge taken at that particular moment. It is possible that a person can lead to committing a sin of murder but this is not the instruction of humanity and righteousness. Quality of good conduct can be easily transferred from person to person and this can impress the strangers to be ones acquaintance. A person should inculcate righteousness and piety into oneself and follow the path of prosperity and happiness in order to gain something in this life and hereafter. Irrelevantly creating issues and taking them to an extreme is a very disgraceful sin. The most important and essential action is to turn towards Allah for guidance, perform Salat, pay zakat and refrain from defrauding and bad deeds. It is evident that sinful actions of a single person can lead to punishment of the entire household and the city. Thus quit performing wrong and vicious doings because they lead to a dreadful end. If your neighbor holds misunderstandings regarding you, try your best to eliminate them. It is in the hadith that the supplication before the time of problem is the one that is accepted because once the tough time is inflicted everyone turns towards prayer. Thus perform dua at the time of peace and harmony. Righteousness always impresses other people and Allah does not waste His people who are righteous and pious. Promised Messiah (on whom be peace) says that I have read in a book that Syed Abdul Qadar Shah Gillani possessed a very virtuous soul. He once shared with his mother that my heart is not satisfied and I am not happy with the prevalent worldly actions. I want to find a saint who can guide me towards the peaceful path of virtuousness. Listening to the wish of her son, Syed Abdul Qadar’s mother allowed him to undertake the journey in search of truth and sewed money (Persian coins) into the lining of his coat under the armpit, thus hiding it away and instructed to use them when needed. Syed Abdul Qadar Shah Gillani then requested his mother to give him some advice. His mother instructed him to always speak the truth because it can save one from great worry. On his way from the jungle, the caravan was attacked by robbers. Upon seeing Syed Abdul Qadar Shah Gillani in an impoverish condition, one of the robbers mockingly questioned if he was carrying some valuables. Following the instructions of his mother, Syed Abdul Qadar Shah Gillani told the robbers about the money sewed into the lining of his coat. Upon search, the robbers found the Persian coins. The robbers were caught up with surprise and upon inquiring of the reason of why he spoke of the truth, Syed Abdul Qadar Shah Gillani told that ‘I am travelling in search of true path and upon my departure my mother had instructed me to always speak the truth. So indeed this was my first test and I did not want to lie.’ The leader of the robbers was so impressed by Syed Abdul Qadar Shah Gillani’s good act that he repented over his unlawful acts and asked for forgiveness along with the entire group of robbers. Thus this story emphasizes over the fact that we should self-audit ourselves. We have also accepted the truthfulness of Promised Messiah (on whom be peace) because religion Islam was on a downfall and no one was following its true teachings. If a person wants to follow the true teachings of Islam, it is essential to accept and proclaim the advent of the Promised Messiah (peace be on him). Lie appears to be a very minimal wrong act that is very common but in reality is a very frightful sin. It is the demand of Bait and righteousness that we abstain ourselves from lying. Many people have migrated to other countries because they were not allowed to practice their religion with freedom and liberty in their home countries. Thus all of these people who are living in the western world and who have taken refuge in these countries for the sake of religion should never lie and be very careful of their acts. Allah has inculcated good deeds in people so that they be used in the proper manner to attain maximum benefit rather than be wasted. Islam does not preach strictness. The righteous people are those who are exalted in their belief and try their best to improve their Salaat. They not only try to overcome the irrelevant thoughts during the Salaat but also ensure that they pray on time and spend in the way of Allah. Exalted beliefs lead to true faith. Such people are the ones following the right path that leads to success. They shall reach their ultimate destinations and get rid of the worldly problems. Thus Allah has provided to us definitive guidance in the Holy Quran to achieve righteousness. Therefore, our Jama’at should be the most worried and concerned about the existence of righteousness in them. Fear of Allah is embedded in the fact that one should self-analyze the overlapping of his/her actions and sayings. And if the actions are not in accordance with the sayings, the person will have to face the wrath of Allah. The hearts that are impure have no importance for Allah no matter how sweet and pure the verbal communication is. May Allah save us from the wrath of Allah (Ameen). Thus my Jama’at should understand that they have come to me so that they shall be exalted into a fruitful tree. Every one of you should analyze his/her inner and outer self. If God forbid our Jama’at is also hypocrite then we shall not achieve a good ending. When Allah sees that a Jama’at that doesn’t have anything in their hearts but proclaims a lot through their words, Allah does not care as He is all sufficient. Although, Allah had prophesized the victory in battle of Badr but still Holy Prophet (peace be upon him) used to pray for the victory. When Hazrat Abu Bakar (may Allah be pleased with him)) inquired that when Allah has already promised us the victory then what is the need for prayer? In answer Holy Prophet (peace be upon him) said that Allah is all sufficient. It is possible that the promise made might have some hidden conditions. Thus this is also a very fearful stage for us. Although Allah has assured Promised Messiah of bountiful blessings and success but we need to analyze ourselves to be a part of those promised blessings. Our Jama’at most importantly needs righteousness because they have accepted the advent of the Messiah of time. So the people who had indulged in any kind of ill acts accepted Hazrat Messiah Maud as the Promised Messiah (on whom be peace) and are now associated to him so that they can get rid of all those sins. If someone has fallen ill and no treatment is undertaken, the illness does not finish. Just like a mole on face results in concern that it might grow very large to darken the entire face. Likewise, sinful acts also produces dark mole on the hearts. If the insignificant sins are not amended they can accumulate and lead to big sins and ultimately darken the entire heart (in figurative meaning). May Allah help us achieve righteousness during the blessed month of Ramadan (Ameen) and help us be the members of Jama’at who try their best to refrain from bad deeds and who perform actions in order to gain the pleasure and love of Allah (Ameen). May we come out of this blessed month in a manner that we may never again indulge in sins committed in the past (Ameen). May Allah help us achieve our goals (Ameen). Huzoor announced he would lead Janaza Prayers for two deceased after Friday prayers.